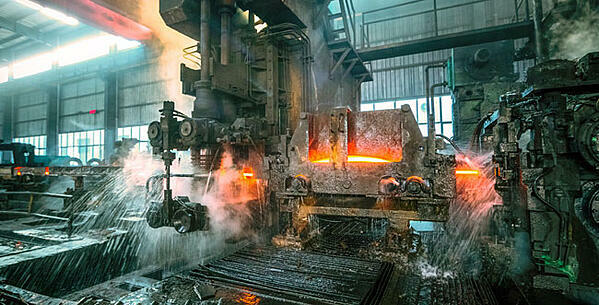 Steel mills pose challenging conditions for motion feedback. A prime example is the hot rolling process which starts with heating 8-inch thick slabs of steel in a furnace to about 2250°F. Next, the pieces pass through the roughing mill, where they are cleaned of layers of oxidation known as scale by high-pressure water jets, and flattened to a thickness of about 1 inch. Then, these strips pass through three separate sets of weighted rollers, which thin them even more. At the end of the process, which takes about four minutes, each piece has been re-shaped from an 8-inch-thick slab to a 3/16-inch-thick strip that is then coiled for shipment. To protect personnel, operators run the equipment from a safe distance, based on feedback. The only kind of feedback device that can tolerate these types of conditions is a resolver. Resolvers are analog devices that do not need onboard electronics, making them ultra-robust. All resolvers are not created equal, however. High temperatures and use of water jets create tough conditions for motion feedback. The mill uses resolvers in over 60 different locations. By far the most challenging application is at the crop-shear guide, which positions the strip on the line just before the crop-shear. This resolver connects to a lead screw that moves the side guides in or out as the lead screw is rotated by a large motor. 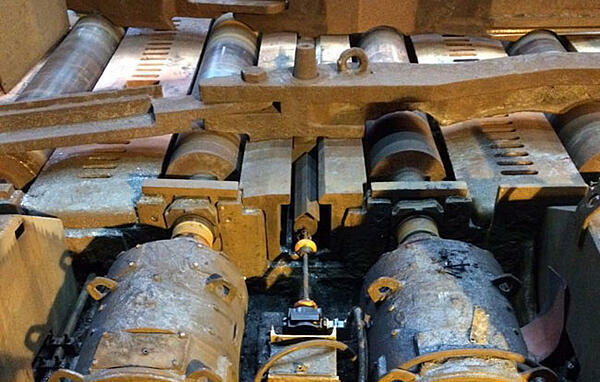 The purpose of the resolver in this application is to provide the remote operator with information regarding the position of the side guide during the steel rolling process. In the event of a resolver failure, the line must be shut down while the device is replaced. The location presents the toughest set of conditions for feedback on the entire hot-roll production line. The resolver is located about three feet below the surface where the red-hot steel is being rolled and about six feet outboard. This subjects the resolver to very high temperatures. Worse, it is exposed to constant spray from the descale water jets. The mixture of hot water and steel contaminants cascades off the strips to bombard the resolver. In an attempt to stretch the service life of the resolver, the maintenance team even created a rubber umbrella to put over it. It didn’t help – the actual service life of the initial brand of resolvers was anywhere from four months to four weeks. The designers at Dynapar, NorthStar and Harowe were confident that they could build a better mousetrap. To mirror the current installation, the team combined two existing products with a track record of durability: the Harowe Size 21 frameless brushless resolver and the NorthStar H56 Rotopulser®, a digital pulse generator specifically targeted at heavy industrial speed, length, and position applications. The result was the Dynapar NorthStar R56 foot-mounted/56 C-Face mounted resolver. Between 2 motors, a resolver is shown connected to a lead screw that moves the side guides as the screw is rotated by the motors. As of this writing, 18 months after installation in early 2015, the resolver is running just fine. That means an improvement in lifetime and durability of 4.5 to 18 times compared to the incumbent product.